This undated image released by the Marine Ice Automobile Expedition, shows expedition members using trucks to cross the North Pole. 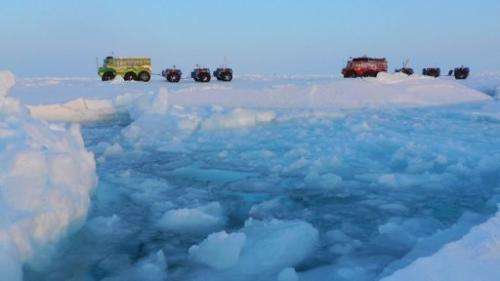 Russia has ordered the urgent evacuation of the 16-strong crew of a drifting Arctic research station after ice floe that hosts the floating laboratory began to disintegrate, officials told AFP. Russia has ordered the urgent evacuation of the 16-strong crew of a drifting Arctic research station after ice floe that hosts the floating laboratory began to disintegrate, officials said Thursday. Natural Resources and Ecology Minister Sergei Donskoi set a three-day deadline to draft a plan to evacuate the North Pole-40 floating research station, the ministry said in a statement. "The ice is disintegrating," a ministry spokeswoman told AFP. "Cracks appeared in the floe." The station is currently home to 16 personnel. "The destruction of the ice has put at risk the station's further work and life of its staff," the ministry said in a statement. If the situation is not addressed, it may also result in the loss of equipment and contaminate the environment near Canada's economic zone where the station is currently believed to be located, the ministry added. Scientists point to increasing signs of global warming in the Arctic which is being significantly affected by climate change. The UN weather agency said this month that the Arctic's sea ice melted at a record pace in 2012, the ninth-hottest year on record.